Part and parcel of you increasing your chances of winning when playing any poker game is by you knowing the best way for you to play off your hand. There will be times when the only course of action you should take is to fold your hand, and that is of course when there is no realistic chance what so ever of you winning with that hand. 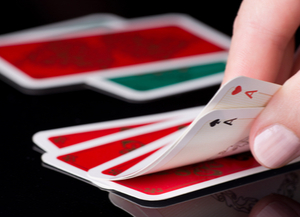 Sometimes however you will be dealt out a very strong hand, and that is when you need to adopt a betting and playing strategy that will allow you to get the maximum pot value with such a hand, but without giving away any tells that your hand is very strong and is likely to beat your opponent’s hand or hands. But there are also going to be times, when it may be very beneficial for you to bluff your hand when playing poker, which is when you give the impression it is a hand worth playing and betting on, when the opposite is in fact the reality! 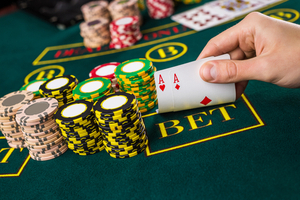 It is important for you to know as much about the playing style of the players you are playing against at any poker table, for if you have a good idea of the way that they do play, you can use that information to your advantage. Poker is not only about studying your hand and the community cards it is just as important that you study your fellow players. It can be and often is the case that some poker players will give away little tells that can give you an insight into whether they are holding a strong value hand or a low valued one, and often some players who are bluffing will give away very obvious signs that they are doing so. But that does of course mean there is a risk that you may give away tells to your opponents too, so you need to adopt a stance when playing poker and religiously stick to it too, possibly remaining hard faced and stern looking no matter what value of hand you are holding! As for when the right time is to bluff your hand, well that is a strategy you are going to have to adopt for yourself, for if you have mastered reading other players, and get the very real impression one of them hasn’t got a rock solid hand, then you should set about bluffing your hand when it is just you and them left in a game. Many players will play a very conservative game of poker, meaning that the only time they are going to play on with their hand is when it is a hand they are convinced is strong enough to win. Therefore often it can be worth chancing your arm and bluffing such people initially, to see if they do fold their hand, and it can often be the case that they will. But believe me when I tell you, you should never get into the habit of bluffing too many times for if you get into the habit of bluffing too many times you really are going to get found out. Bluffing is an Art Form Treat it as Such! Now if you do win a poker game by bluffing, and your opponent folded his or her hand, then you are under no obligation to reveal your hand to them, for as the last player standing the contents of the pot is yours. That is important to know, for if you do feel like showing off once you have bluffed your way to a pot players sat around the table, and not necessarily the one you just beat are going to be aware of the way you played when bluffing that hand, and will be looking out for you doing so again. The best poker players in the world are never going to reveal a hand once they have bluffed their way to the pot, unless they are forced to at the showdown stage of the game, in which case other players will see that you have bluffed, but you could always fold your hand before you get to that stage! To master bluffing and bluffing only ever now and then make sure you watch some other poker players playing, maybe on websites such as YouTube, as by doing so you will see how those players handle their bluffing exploits in either successful or unsuccessful way! In the world of poker, you are going to meet some outrageous poker players, who never seem to shut up when they are playing, and conversely you are going to meet some very stern faced poker players who will not interact what so ever with other players. You will therefore be best suited to playing in your own unique style, for by keeping a constant so to speak when playing, and not detracting from the way you are when playing poker it can become very difficult for other players to read you and know that you are bluffing. A quiet poker players who suddenly becomes a little most active and communicative when they are playing off their hand is sure as hell giving away a tell, but you will need to learn whether that tell is that they are holding a good hand or bluffing. It can often be the case that a player is going to give away a possible bluff by saying something, obviously they are never going to say outright I’m bluffing, but at the end of the day a tell is a tell so avoid giving any away, but become adept at spotting them too!